Though it's taking rival Marvel Studios an exceptionally long time to get a female-led comic book movie on cinema screens, DC and Warner Bros. are already planning to follow their Wonder Woman standalone film with a Harley Quinn spin-off, according to The Hollywood Reporter. 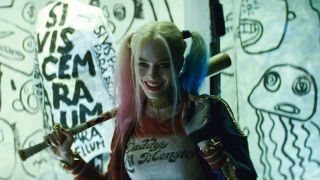 The live-action version of the character, who's set to appear in the much-anticipated Suicide Squad this August, has already amassed a following from her appearances in the film's excellent trailers. Harley Quinn actress Margot Robbie will produce the film, which could also feature a number of other female DC characters, including Batgirl and the Birds of Prey. Robbie reportedly brought in a writer to help develop and pitch the film, and while no names have been revealed, THR has stated that this scribe is female. We can only hope that other female DC favourites, like Poison Ivy and Black Canary, will also make an appearance in the film.